It’s been tough going for many silver bullion investors who look back fondly on silver’s surge to nearly $50/oz in 2011. But things are set for a turnaround judging by recent COT reports, investment demand as seen in ETF holdings and non-investment metrics such as strong industrial demand and falling mine supply. Earlier this month you could be forgiven for thinking that silver’s future certainly contained no shiny lining of any kind. 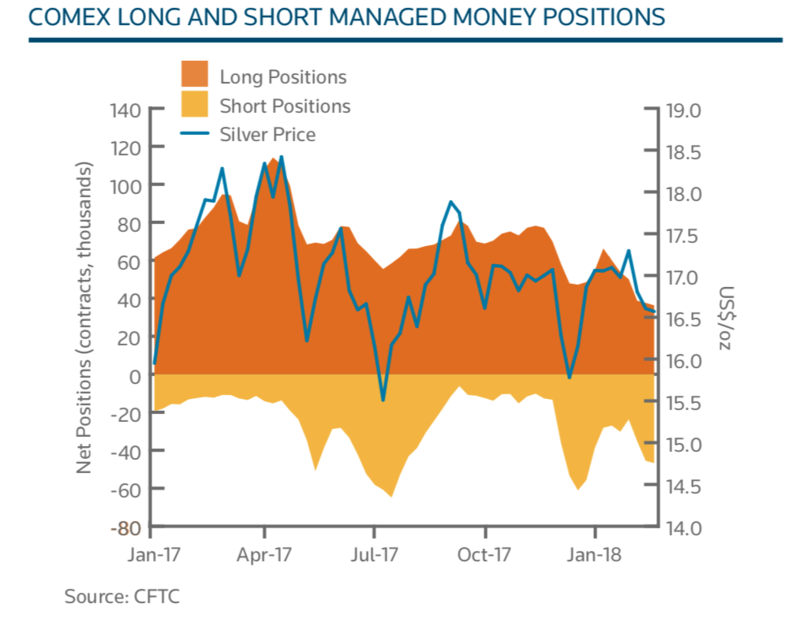 There were a record 39,604 contracts (equivalent to five-and-a-half metric tons) of net short positions in silver futures held by money managers. Some would see this as bearish but the record shows that such positioning is generally bullish from a contrarian perspective and frequently presages sharp reversals higher in the price of silver. On the arguably more important long term side of the market is investment demand. Total silver ETF holdings reached an eight-month high of 665.4 million troy ounces last week. Investors increasingly like the medium and long term fundamentals of the silver market. Not so bearish after all. On the all important physical, non-investment part of the silver market, life is looking even shinier. Industrial demand currently makes up about 60% of the silver market and is set to climb. 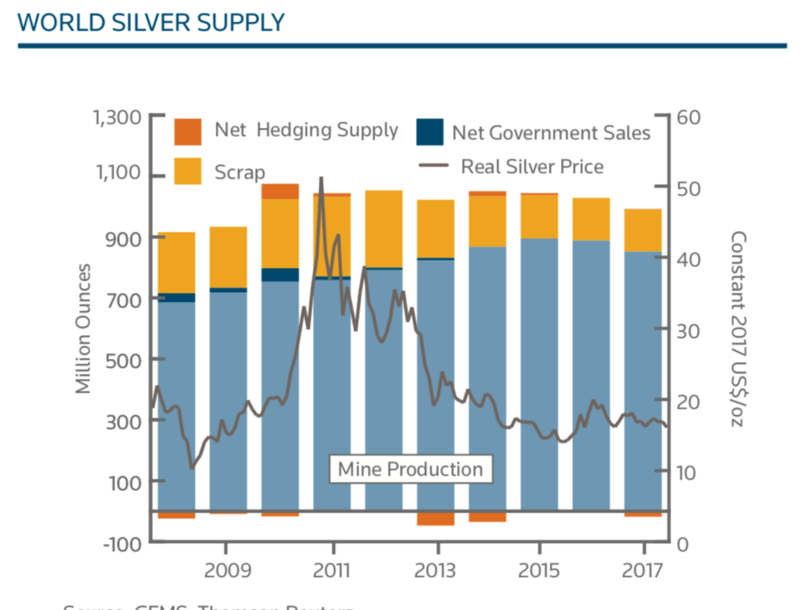 A recent report from Thomson Reuters’ GFMS and the Silver Institute has found that demand for silver in the non-investment space climbed in 2017 and is expected to continue to do so this year and beyond. These figures – speculative bets on a lower silver price on one hand but strong investment and industrial demand on another – look counter intuitive to the uninformed observer. They likely show that silver remains undervalued versus gold and indeed versus very overvalued stock, bond and indeed most property markets. We look at money managed positions in silver futures as they serve as a good proxy for for investor and speculative activity on the COMEX. Currently (and pretty much since August 2017) speculators are more short than they are long, with a lot of cash betting that silver is set for further fall in price. As of last week the managed money positions made it 9 consecutive weeks of bearish sentiment. According to several market analysts the metal is now “oversold” and “vulnerable” to a hop up the price scale. Interestingly, despite the air of negativity, silver has remained resilient – falling by just 2% in the last two months or so. We saw a similar situation last year, despite a wave of bearish speculators silver bullion managed to finish the year up 6%. It’s clear that the weakness in the price is coming from negative speculation rather than the fundamentals – all of which point to a bullish future. The newly released 2017 Silver Survey makes for some interesting reading and is something that should perhaps be handed over to all those bearish money managers. 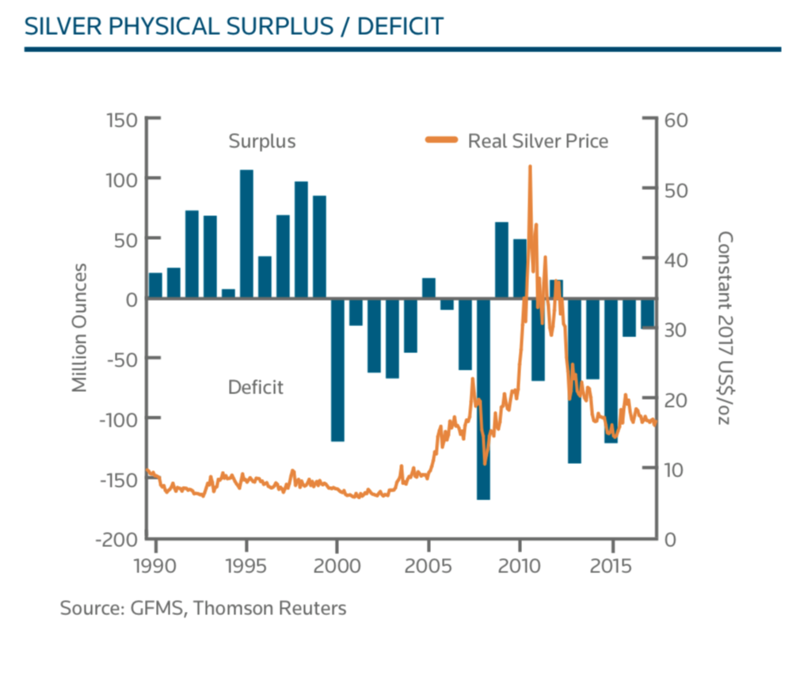 Whilst investment demand in the form of silver bullion coins and bars did fall last year (mainly thanks to lower demand in the US and Canada) all other physical metrics point to an extremely bullish market. Industrial demand, jewellery demand and supply restrictions all point to a much tighter market than the likes of COT and even some ETF holding reports would have you believe. Thanks to photovoltaic growth (up 19%) industrial demand grew for the first time last year, since 2013. Whilst jewellery and silverware demand increased by 2% and 12% respectively. These numbers mean little if you don’t know the juicy numbers – the huge tightening in supply. Global mine production fell by more than 4% last year, this was the second annual decline. As with any industrial market, the industry doesn’t just rely on fresh metal from the ground – scrap is a major factor. But this is in an even worse state, falling to 138.1 Moz in 2017 – its sixth successive annual decline. Generally silver likes to move in line with gold, if at a much lower price. 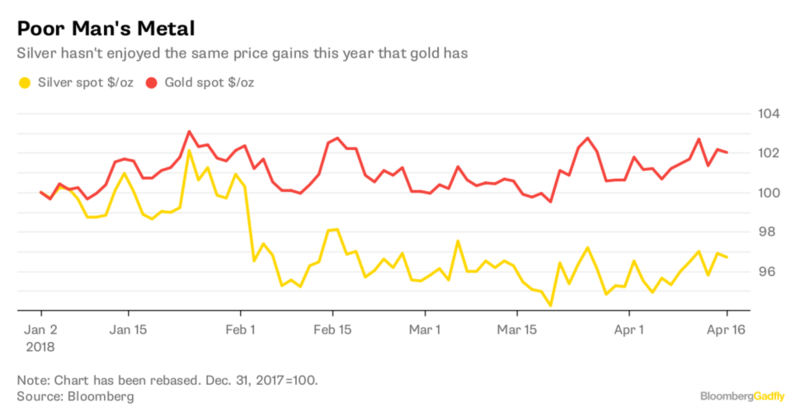 However, this year it has not been able to match up to it’s own strong performance in early 2017 or gold’s performance this year. Currently the gold price is reacting nicely to global events whilst silver has lagged behind. was during the 2008 global nancial crisis, when the ratio surged above 80. Meanwhile, a high ratio in the early 1990s was in response to the Gulf War. It is arguable that in anticipation of a crisis the market could see 80 or beyond. At the end of 2017, the gold:silver ratio was at 77 (though the full year average was just a moderate year-on-year increase to 73.9), a high level that perhaps suggests that the market is trying to tell us something. We suspect the high gold:silver ratio indicated that the market had been expecting another major crisis could be looming, or at the least that it was about time for equities correction, and therefore investors had been accumulating physical gold in the market. Whilst gold is probably the safest way to hedge against global crises, a falling dollar and increased monetary inflation, silver is by far the most profitable. Consider that during gold’s last big rally in 2011, it reach $1,900 an ounce. At the same time silver was at $50/oz. Around 200% higher than silver’s current $16.75 price. And, a much lower ratio to gold. Investors are likely to see this as they watch the gold price slowly tick upwards in response to ongoing, uncertain events. There will no doubt be many who turn to silver as a cheaper and more likely profitable complementary hedging asset. Indeed, we see them every week with very strong demand for silver coins (VAT free) from our UK/Irish and EU clients in recent weeks. It can be very easy to dismiss something on first glance. In this case it is the price and speculators that are “painting” silver in a bad light. If anything, this should be the selling point. It is very likely that silver is in the early stages of a bull run. Its current price should not be dismissed by investors instead the fundamentals should be the focus of anyone deciding how best to allocate their portfolio. Some analysts of late have suggested owning silver over gold. We would not advocate this as we believe that both merit a place in a well-balanced and diversified portfolio. We believe silver will outperform gold and offer opportunities for silver buyers to rebalance into gold after seeing gains in silver. We fully expect both precious metals to outperform stocks, bonds, currencies and most other assets in the near future.